"You idiot." The words slipped out before I even thought about them, whispered in the early morning darkness. As I tiptoed through the house, trying not to disturb my family, I tripped and bumped into a door, once again displaying my massive lack of grace. So the harsh words came out - words I would never speak to someone else, but found it far too easy to direct at myself. I've struggled with my self-image as long as I can remember. 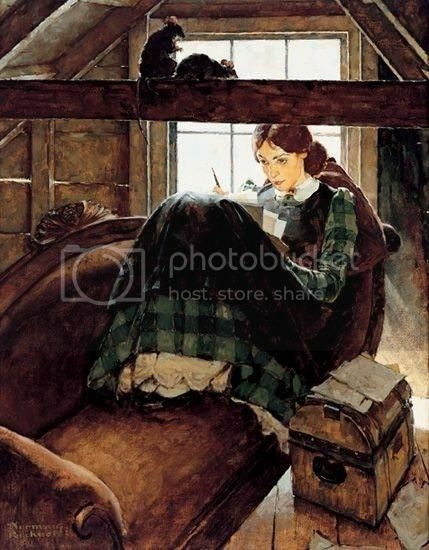 As a child and teen, I was painfully shy, awkward, and very much an introvert, much more comfortable spending time with books and horses than with people. I wasn't talented. I definitely wasn't athletic. I was never the pretty one. I was the one who would "find someone who loves her for her sweet personality" according to a friend's mom. The words she didn't say were just as obvious: I would never find a man who thought I was beautiful because I wasn't enough. "Not enough" could pretty much sum up Leah's life, too. She lived in her sister's shadow - the older sister, the ugly sister, the sister who just couldn't measure up to Rachel. I feel her pain. I think I get Leah's story so much because I have been Leah. My life doesn't look like hers, but we're alike in so many ways. For so long, I struggled with being enough. I was't pretty enough or athletic enough, so I tried to find fulfillment elsewhere. I dieted in hopes of being thin enough. I studied endlessly in the hope that my grades would be good enough. I spent so many years trying in vain to find the one thing that would make me feel worthy. That's exactly what Leah did. She tried so hard to be enough for Jacob. She knew she wasn't loved, but when she gave him a son, she thought surely Jacob would love her. But he didn't. Time after time, son after son, she hoped and prayed this time everything would change, but it never did. How many of us do the same thing? We search for that elusive thing called "enough." If I was thinner, prettier, smarter, more successful; if I had a better job, a bigger house, a husband, a degree. The sad fact is, we will never be enough in this world. But what the world thinks of us isn't what matters. To your Father, you are already enough. God loves you, just as you are, with all your failures and imperfections. You are His daughter, His priceless treasure, His masterpiece. 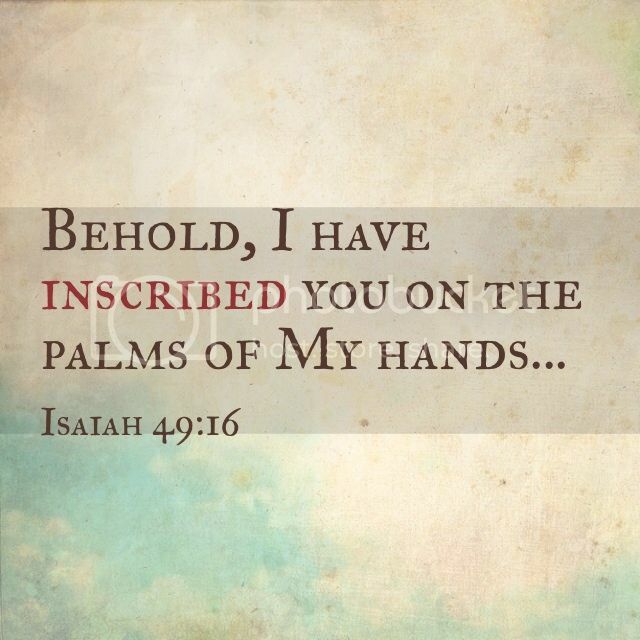 You are inscribed on the palms of His hands. Gen 29:35 And she conceived again and bore a son and said, "This time I will praise the LORD." Therefore she named him Judah. She might not be enough for Jacob, but to God, she was perfect. God has already given us a reason to praise Him - He has shown us that in Him, we are enough. We don't have to measure up. We can't measure up. But He embraces us, with all our imperfections, and shows us that we are already enough. Hello, my name is Amanda, and I'm a writer. I still can't say those words aloud. It's too scary. The best I can do is type them. There's an expectation, a kind of reverence, attached to that single word, "writer," and I just can't say it along with my name yet. I blog. I write fiction. I've submitted a query for an article to a major magazine, a short story to another magazine, and I've entered a huge fiction contest. (Now the waiting begins - it will be at least December before I hear back from any of them.) I've won a small writing contest. A few posts have been chosen as favorites in the weekly link ups I write for. My laptop and iPad are filling up with writing - blog posts, short stories, scenes and pieces of what will eventually (I hope) be a novel. So why can't I tell people "I'm a writer"? The biggest reason is fear. I know the next question will be "What have you written?" Nothing published, except my blog. I can't point to a book or story or article yet. I don't have concrete evidence that I am a writer. 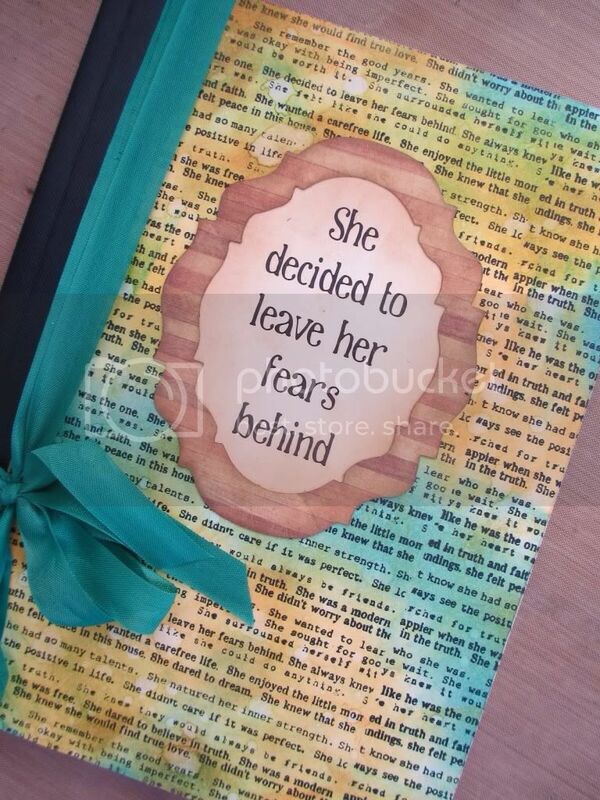 The fear lingers at the back of my mind - what if I never do? What if I tell everyone "My name is Amanda, and I'm a writer," but nothing happens? What if there are no articles, no published stories, no books? Then what? I think I'm still waiting for that magical moment when I'll really feel like a writer, when this whole dream I've had since nine years old will come true. I'm not sure if it will happen with the first article, or the first paycheck, or when I sign a book contract. I'm not sure when it will come, but I can't wait for the day I can fearlessly say, "I'm a writer." Because deep down, that's who I am. I'll write whether there's a contract or not. I'll write even if I never get a paycheck for it. I'll write because it's my release - it's what I have to do. It's what I was made to do. 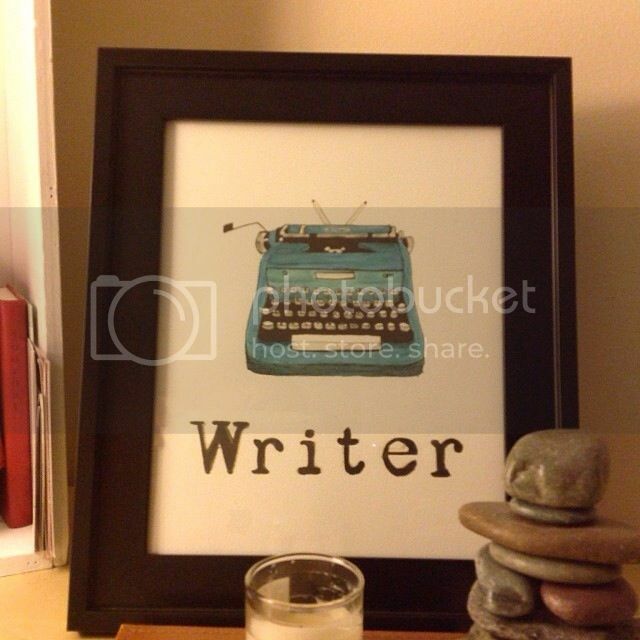 That's what really makes me a writer.